We don’t do a lot of recipes here but this one is just too good to pass up. Just to warn you though after 30 years of tinkering and playing around there is not much of the original recipe left. Here’s where it all started with the Crab Cooker. They boil’em, mash’em, bake’em and then grill’em. Mashing stage they add Romano cheese of course and here is what I thought was the secret ingredient, they put their dill pickle tartar sauce in it. I looked high and low for dill pickle tartar sauce. Dill pickle relish. No body ever hear of it. Do you think they were pulling my leg? I couldn’t find it anywhere. So that is as far as I got with the original Crab Cooker recipe. Instead, I used sweet pickle relish with extra mayo and Parmesan cheese instead of Romano. 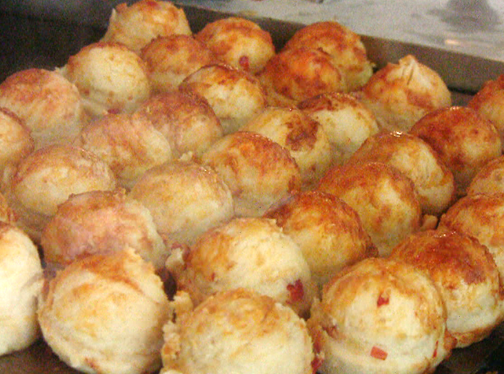 Because of the high volume at the Crab Cooker they have trays and trays of mashed potatoes that they keep warm in the oven and throw on the grill for that hint of mesquite just before they serve it up. They are always delicious! My mouth is watering just writing about it. I never got to the baking or the grilling stage either. I don’t know why I am telling you all this except I don’t want the Crab Cooker suing me for trade secret violations. This is what their recipe turned into. I use freshly harvested new potatoes from the garden. Yea, that is not always going to happen. 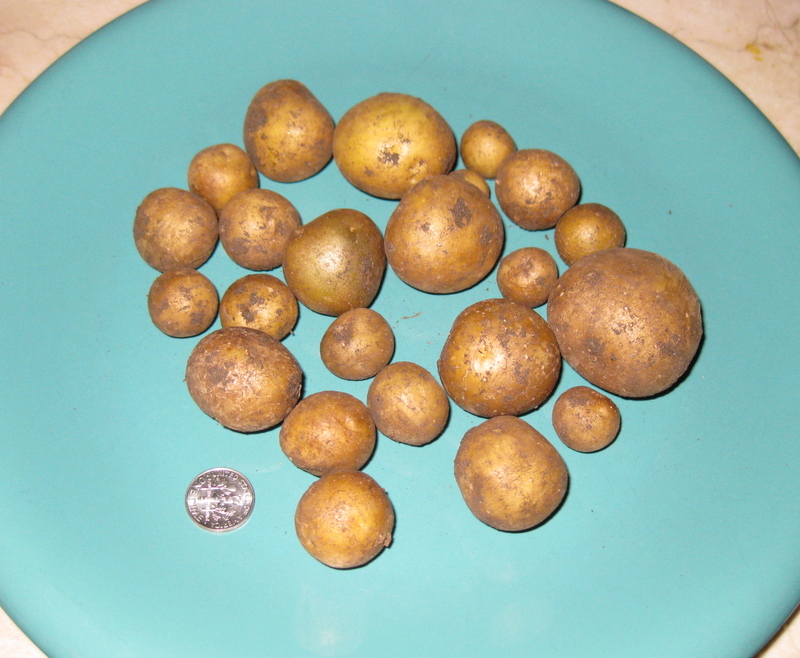 I had about, count them, 23 tiny to medium tiny potatoes this year and ten people for dinner. Ten people =10 pounds of potatoes. Buy what you need. This year I added homemade Italian dressing which includes, oil vinegar, garlic, salt pepper, and Old Bay seasoning, (I use this on everything) Wish Bone Italian Dressing is o.k. Fresh grated parmesan cheese and not just any parmesan. No skimping here. I was watching a cooking show. The lady described this kind of Parmesan as a cheese that if you had to pick one cheese to be stranded on a deserted island with it would be Parmesano. Note the spelling. The authentic parmesan cheese ends in an O. The only true Parmesan Cheese is authentic Parmigiano Reggiano from Italy. It takes about 8 Gallons of milk to make a pound of Parmigiano Reggiano! This cheese has a high protein and vitamin content and is praised for calcium as well. It is not necessary to be an expert cheese maker to recognize real Parmigiano Reggiano, the markings are pressed into the whole side of the cheese wheels. According to the ancient laws of Rome, this cheese can only be produced in a very limited areas of Italy. This is one of the key reasons that this cheese can not be copied. Trader Joes sells is it for $13 a pound and I honestly can not live without. It is to die for. Then if I am feeling particularly playful I will add a tablespoon of sweet relish just for the fun of it and for old time sake. Because we are on the road Thanksgiving day, I make the potatoes the night before and put them in a 9×13″ baking dish so I can just pop it in the oven to heat up when the turkey comes out. These are so good you don’t need gravy. But if you must have gravy, save the broth from potatoes and add it to the turkey drippings. First, add 5 or 6 tablespoons of flour to the drippings. Heat and stir until the flour has soaked up all the drippings then slowly add the broth, stirring all the while. At the end add milk or half and half to make it really creamy. Oh my god this is a little piece of heaven.The gravy recipe is from my sis Michelle a dear friend from Lake Arrowhead. It never lumps, is always perfect. Now in case you need to feel guilty about all the calories in this dish let me just put your mind at ease with the nutritional benefits of potatoes. 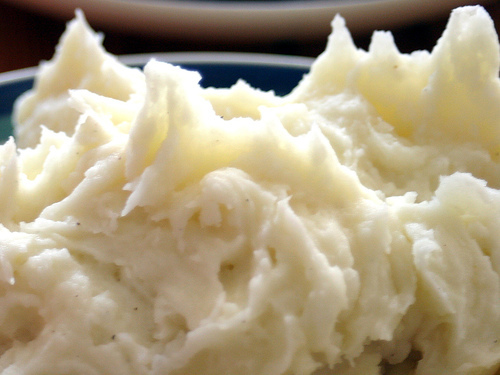 Potatoes contain all 22 amino acids to form complete proteins after easy digesting. It makes for easier protein absorption than the digestive effort of breaking down the complete proteins in meat and dairy. Potatoes are a high source of potassium, even more than bananas, and are rich in other minerals. They are also rich in Vitamin C and B6. More importantly, Agricultural Research Service plant geneticist Roy Navarre has identified 60 different kinds of phytochemicals in the skins and flesh of a wide variety of potatoes. If you need more convincing click here and learn how Potatoes can save your life. It’s all good. Food is one of the great joys in life. Playing, inventing, experimenting, writing, reading, tasting, food is a wicked pleasure. And even though parents always tell you to never play with your food I give you all permission to break this rule and Have Fun with your Food. There is dill pickle relish available here in Southern California, in most markets. Detest the stuff, though. Wow, those sound exquisite. Are you air mailing me some?